Forums - Not much action.. I bought the Monoliths a couple months ago as a successor to my Parker 95s and am driving them with a SE84CS in near field listening position. I've been lucky to hear quite a few of the other Decware speakers as well including HDTs, ZOBs (with fostex DFR-8), and ERR Radials. IMO the Monoliths have the best balance of all of these. Detail and presence of the HDTs, Transparency and speed of the ZOBs, Warmth of the Radials, and better bass than anything I've heard. The bass goes low and is perfectly integrated with the rest of the spectrum. The speakers just completely disappear in the room even when listening close quarters. No cabinet coloration or smearing. The tweeter is at ear height (good for spatial detail near field) and integrates seamlessly with the 8" wool cone Silver Flute driver. 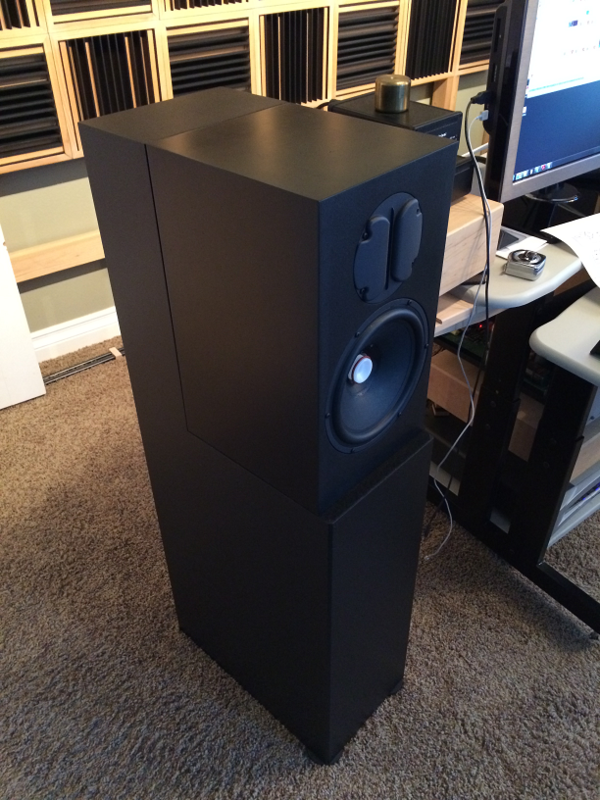 They look pretty good in black too, but after hearing them the looks just don't really matter. The cabinets are very heavy and the finish is durable. Most of the time I leave the grills on. Here's my take on what makes this speaker special. Essentially this is a two way horn speaker. The Monitors (DM945/946) are basically pulling duty as the driver and compression chamber. For me this poses the question, "What would a typical horn speaker sound like if you removed the back loaded compression chamber from the horn and let it play?" My guess is that it probably wouldn't sound as refined as a Decware Monitor which necessarily stands on it's own as a capable speaker. The room is part of the system. 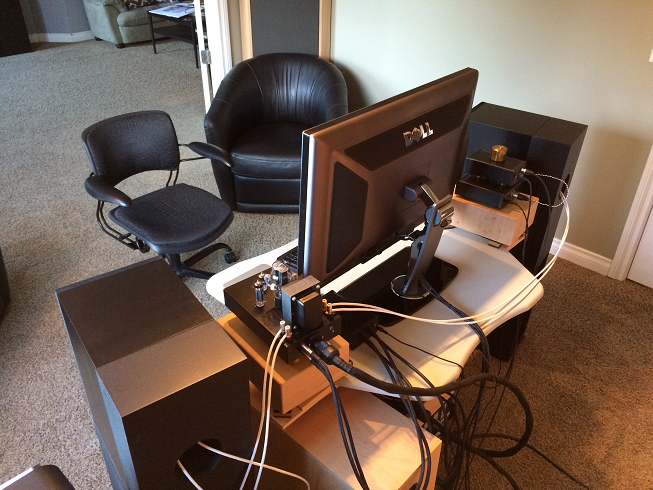 The horn base serves to couple to the Monitors to the room more effectively. This is why the impedance goes from 4 ohms nominal as the Monitors, to 6 ohms nominal as the Monoliths. The added resistance is due to the speaker seeing more of the room and therefore having more load. What this all adds up to is a speaker that has been very well optimized throughout. Brett - great info and insights on this product. With the horn loading into the rear wall, proximity will play a large part in the overall sound I imagine. Could you give me a feel for how far you are placing them from the rear and sidewalls? 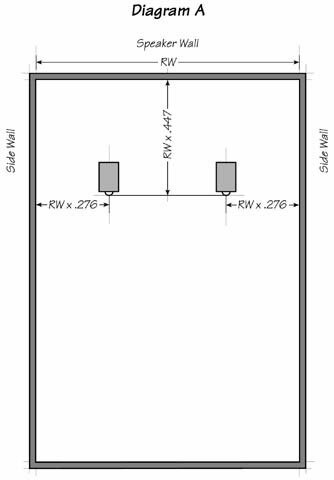 I have my speakers placed on the long wall, about 5 feet from either side wall and when I am doing any serious listening they are pulled out about 30'' from the back wall. Are you hearing any inter- modulation / break up when you have strong low end content and the midrange? How much toe in are you using on these? Thanks for the info. Happy listening, Chris. Based on mode calculations the room isn't too bad. At least two of the three dimensions are golden. 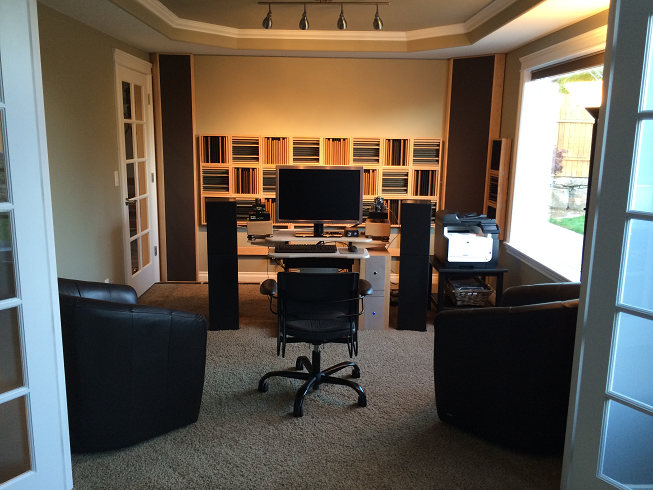 I like that I can open the doors in the back for a more open sound or close them to keep the energy in the room. It sounds good either way. The corner traps were made this way to keep the wife happy but I have to admit I like the way they look as well. They are full of insulation made from recycled denim and are placed in all four corners to control bass modes. 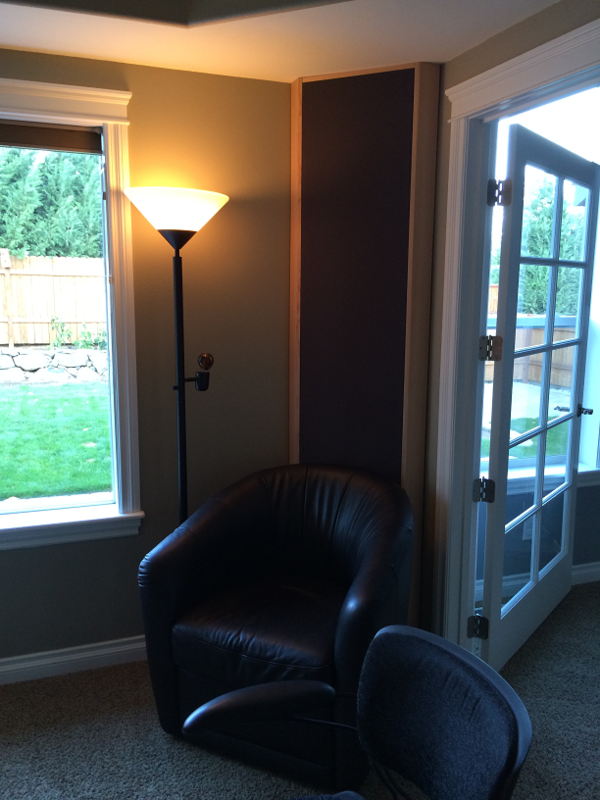 After installing these the room was transformed. I'm in the middle of finishing absorption panels to go on the remaining wall refection points. 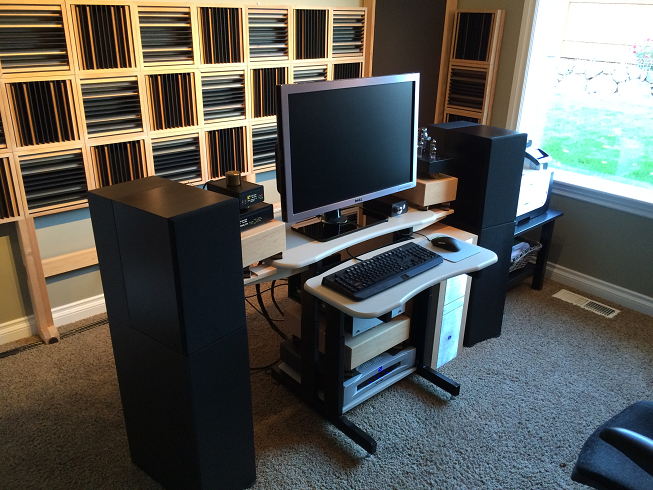 The computer desk and monitor sit between the speakers so that I can integrate all of my media into my audio hobby. Makes working on spreadsheets a little nicer too. I listen from a upright seated position and very near to the cabinets. I can also sit back and distance myself for a better sound stage. 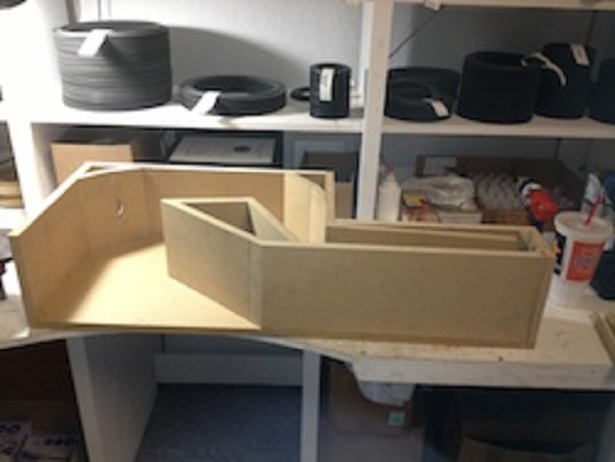 The height of the cabinets and location of the tweeter puts the ribbons right at ear level. I've canted the cabinets back so that the drivers maintain phase alignment. By ear I found this amount of toe in to sound best. They have a very wide dispersion and sound good straight ahead too. If your sitting in the corner chairs your still getting a good sound stage. The speakers are spaced approximately 5 feet center line and as pictured the chair is 5 feet away from each speaker forming an equilateral triangle. This is where the setup sounds best but they still sound great while using the keyboard. 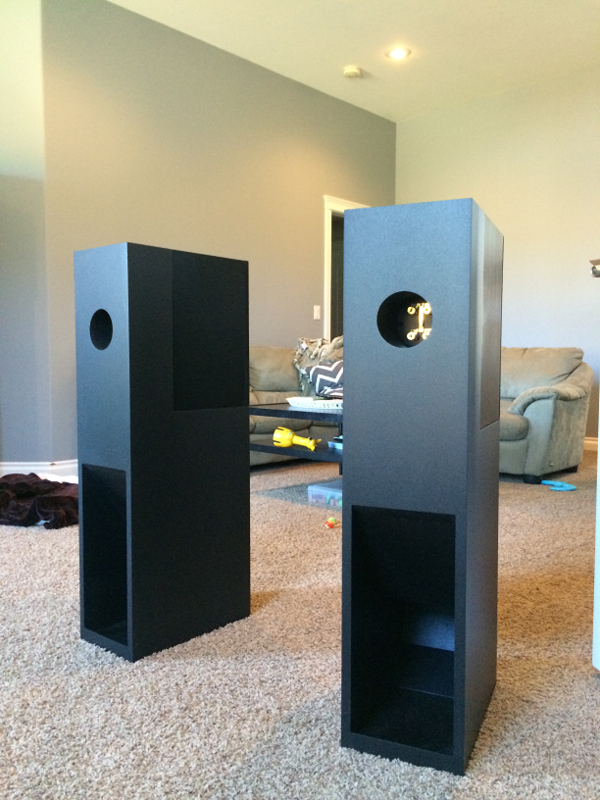 This is a good starting point for proper speaker placement. It's designed to minimize room modes that cause reinforcement or cancellations of low frequencies and in effect yield a more even bass frequency response. Placing speakers or sub woofers near walls and corners will cause those boundaries to reinforce bass and potentially cause room boom. This should always be avoided if possible unless the speaker is designed for corner placement. When it comes to full range speakers (20Hz to 20kHz etc) this becomes even more critical. In the end, calculations like this are only a starting point. With acoustics there are simply too many variables to go on formula alone. After I finish the remainder of the acoustic treatment I will experiment with speaker placement although I'm pretty darn happy with it as is. The only break up I hear is when I send the amp into clipping. This can happen pretty easily with 2 watts when the sound is this clear. I love driving these near to the edge cause they can absolutely rock. Rachel would be a better match for these. I'm in the process of building a 7 watt amp. I've stuck my ear to the end of the horn and I can detect no mid range info, no breathy horn type distortions you might expect. Its just clean fast bass. Now that's what I like to see in a formal dining room. Looks great.